We received excellent customer service from the start. We love our final product, it is stunning and has garnered many compliments. We had an issue with a broken bracket that happened in transit and the customer support team was stellar in dealing with it. Thank you for making us look good! I was so pleased with my experience with APG Exhibits! The order process was quick and painless, and our HopUp display actually arrived earlier than expected. The turnaround was quick and the quality of the display even exceeded our expectations. We’re already working on a design for our next order. Very Pleased! We purchased a Hop up Kit display to be used as a back drop for our photo booth. The image was very clear and the display was very professional. I wish I would have adjusted the image position a little more before I approved it. We will do business again with you. My company needed a new pop-up booth for an upcoming trade show and we went with the OneFabric curved unit. APG gave us great service and fast turnaround, and the booth contributed to a very successful show. We couldn't ask for more! I must say what a great experience we've had with APG Exhibits. From the moment we were browsing through the website and spoke to one of the sales reps all the way through to the ordering and receiving of our display. Keep up the OUTSTANDING Customer Service! APG provided professional service and quality beyond our expectations. Replies to all our inquiries were near instantaneous, artwork approval and suggested edits were immediate, and production time was ahead of schedule. We are incredibly pleased with the service and quality of our banner and will be using APG again. APG Exhibits, Trade Show Booths, and Trade Show Exhibits APG Exhibits is committed to fostering a company culture that exhibits kindness in all areas of our business. We strive to create a work experience that begins internally and radiates externally through all our endeavors. We provide an employee and customer experience that accentuates benevolence, graciousness and understanding. No wonder so many marketing professionals and small business owners choose us when they’re looking for effective, affordable exhibit solutions. APG Exhibits - Our Displays. Your Brand. APG Exhibits has over 30+ years of experience in trade show marketing. APG Exhibits has over 30+ years of experience producing trade show displays, expo exhibits and marketing products, so we know how to make your trade show booths a smash-hit. We‘ll make your job easier every step of the way, with marketing expertise that drives clients to your trade show booth. Our team is dedicated to bringing you the latest and great trade show displays and exhibits, all with the lowest pricing and best customer service anywhere. Contact us and let our experienced team develop an attractive, eye-catching conference booth that makes you stand out from the crowd! From a simple pull up banner or 10x10 trade show display, to a completely custom trade show exhibit, we have the team and exhibit products you need to succeed. Whether you’re a Fortune 500 company or a local business looking to expand your reach, APG Exhibits’ major-agency pedigree makes trade show success easy. As a sister company of Agency Promo Group dedicated exclusively to trade show displays, our roots run back over 30 years. In that time, our reputation for outstanding customer service and comprehensive branding has been recognized by major clients like the McDonald’s Corporation, to whom we have been a valued partner for over two decades. In a demanding industry, our reputation for high-quality expo displays has stood the test of time. Each of our products combines the best of our history with the continued innovation required to meet the needs of today’s clients. Check out our online store, and browse an exclusive collection of trade show displays and associated products. Our team can meet even the strictest branding requirements, or we can help you create an eye-catching original design. Do you need a large, dynamic trade show exhibit to attract visitors to your area of the convention? 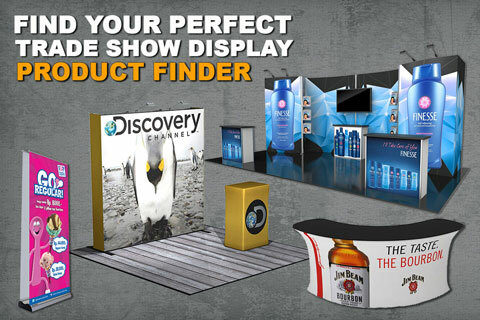 We have multiple styles of pop up displays, graphic backdrops, and trade show truss displays. Do you need some eye-catching additions to an already-designed conference booth? We can provide you with the industry's best table top displays, feather flags, swooper flags, table covers, retractable banner stands and more. Do you need a complete truss system to create a stunning booth for your next trade show? We carry everything from retractable banner stands to complete truss systems and will make sure to team you up with one of our specialists to guarantee complete success and satisfaction. Do you need a completely custom fabricated exhibit that exceeds all expectations? We can create custom tailored trade show exhibits to meet nearly any need and requirement with state of the art solutions. We also provide a wide range of trade show accessories and add-ons, from LCD TV mounts and table covers to literature racks, stand-alone kiosks, and more. In short, everything you need for your next trade show is available through APG Exhibits – contact our team today for more information! The right design can make the difference between an exhibit that dazzles and one that fizzles. If you’re not happy with your current design or need help creating an attractive graphic that everyone will notice, our professional graphics design team is here to help. We’ll work with you to develop a beautiful customized design that will make your exhibit booth stand out on a crowded show floor. Yes we can do that! No matter what your needs, goals or budget is, we can help you produce your entire trade show display exhibit and marketing efforts together from start to finish. Work directly with one of our project managers to make sure you have everything you need done right and delivered on time. Your trade show display expert will help you generate ideas to improve your ROI and will make sure your convention runs smooth. Our standardized and modernized production pipeline ensures an error-free product that will exceed your expectations. Understanding the need for companies to find ways to minimize trade show exhibit booth costs, we’re pleased to offer our money-saving Low Price Guarantee. If you find a lower price for a qualified product (as indicated by the Low Product Guarantee badge on the product page) from an online competitor, we promise to beat that price! You’ll also want to explore our special deals page that is full of fantastic offers and promotions to fit even the tightest marketing budgets. The trade show industry is constantly changing and evolving — exhibit solutions that work well today may be obsolete tomorrow. We encourage you to become a regular reader of our informative trade show blog and subscribe to our free e-newsletter so you can stay on top of the developments and trends that impact your business. You’ll also receive valuable tips and advice that will allow you to improve your trade show and marketing results. At APG Exhibits, we recognize the value of participating in trade shows — they’re an excellent way to get your products in front of many prospects at once and to develop relationships that can fuel the growth of your business. The right display and signage products can make a huge difference in your ability to capitalize on your opportunities. From premium customized exhibits to smaller displays and everything in between, you count on us to provide the right event displays for your needs and budget. Check out our current lineup of superior trade show products and take advantage of our simplified four-step ordering process that will save you time and hassles. And feel free to contact us if you have questions or need additional information. APG Exhibits we’re here to MAKE YOUR JOB EASIER!